Bust 84 (91, 101, 111, 121) cm / 33 (35.75, 39.75, 43.5, 47.5)"
into garments for people all over the world. Especially interesting has been the adaptations and modifications that have appeared. Informed by some of these customisations the Remedy Light is a more delicate version of the original. 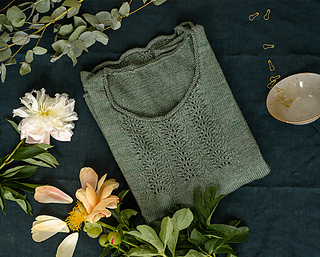 Using Kettle Yarn Co.’s Beyul yarn with its lovely drape and sumptuous handle, the Remedy Light is perfect on its own in summer or layered up in winter. Intended to be worn with 0-5 cm/0-2” ease. It requires 835 (925, 1045, 1180, 1310) m / 915 (1015, 1145, 1290, 1430) yd OR 3 (3, 3, 3, 4) hanks Kettle Yarn Co. Beyul (366m / 400 yd per 100 g; 20% Baby Yak / 20% Silk / 60% ethically sourced superwash Merino) in ‘Shrub’ colourway. 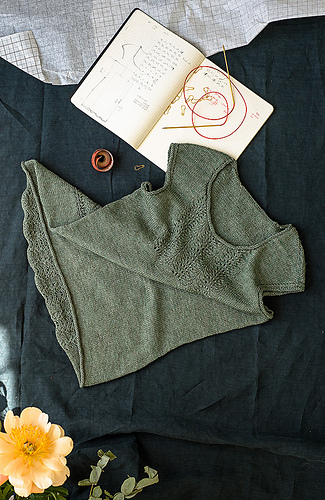 With short row shaped shoulders joined using kitchener stitch it is constructed in one piece.